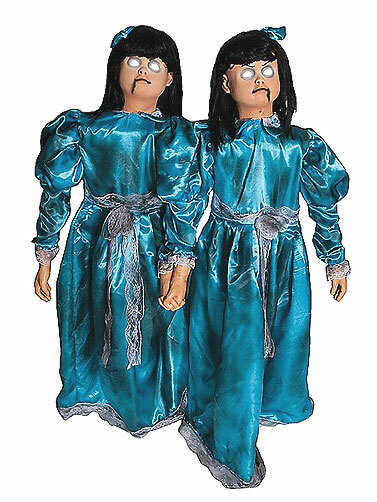 This Animated Evil Twins prop will make a scary prop for your Halloween home. Creepy plastic twins are dressed in matching fabric dresses and are reminiscent of The Shining's Grady twins. 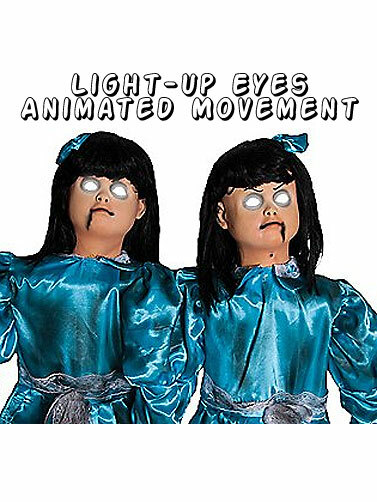 Prop features light up eyes, realistic movement with swinging hands and tilting heads. Eerie audio of the girls saying "I did it, No I did it, we both did it!" and laughing. Some assembly required. Sound and motion activated. Includes plug and adapter. Recommended or indoor use or covered area if used outside. Animated Evil Twins Prop measures 4’H x 3’W.